Born: 1887 in Concord N.H.
Died: September 1962 in Pocasset Ma. 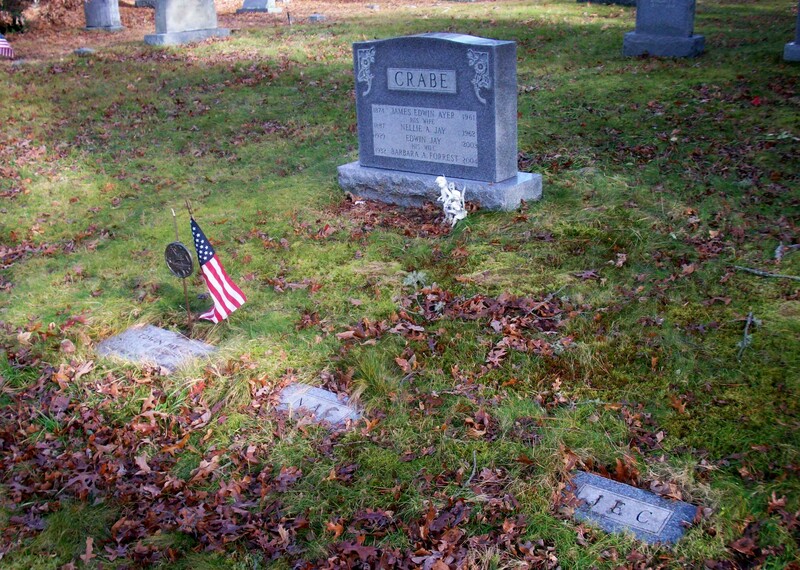 at 75 yrs, 3 mos, 28 d.
To: James Edwin Ayer Crabe; (1874 – 1961) (Allen C. Crabe & Malancey B. Harriman); James married (1) Minnie B. Phinney (1874 – ?) (James Phinney & Maria Miller) in Bourne Ma. on August 18, 1894. 1. Mary Crabe; (1922 – ? ); Married John E. Fox (1911 – ? 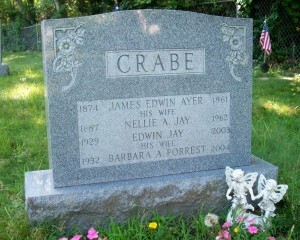 ); Their names & birth years appear on the reverse side of the Crabe family Headstone. 3. Edwin Jay Crabe, Korea; (May 30, 1929 – June 10, 2003); Married (1) Evangeline Frances Small (1930 – ?) (Sumner Linwood Small & Frances Evangeline Manter) & married (2) Barbara Ann Forrest (1932 – 2004) (Herbert Lester Forrest & Aili Ester Hautanen); Edwin & Barbara are buried in Pocasset Cemetery.